The recent interest in the use of FGD gypsum as a soil amendment has resulted in some questions about the longevity of the S supply to crops because of the high rates of application. This material is often applied at rates of 1 – 2 ton/a, which supplies may times crop S requirement. 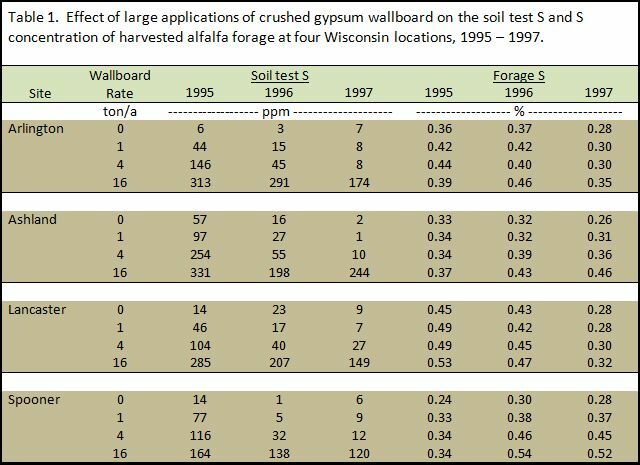 Fifteen years ago I conducted a study that examined the efficacy of land applying crushed gypsum wallboard to alfalfa at several locations in Wisconsin. The objective of that study was to examine the benefit of land application as opposed to landfilling. The wallboard had a S content of 13.4 %, which would supply 268 lb S/ton, or approximately 10 X UW guidelines per ton for alfalfa. Study rates included 1, 4 and 16 ton/a, which were applied and incorporated prior to seeding alfalfa. Studies were conducted at four UW Agricultural Research Stations on a range of soil types. More detail on the use of crushed wallboard for crop production can be found in UWEX Publication A3782. Some suggest that because the plant available form of S is SO42- , an anion, it is subject to leaching and will quickly be depleted from the rootzone. Sulfur, like nitrogen, is cycled in the soil and will become a component of the soil organic matter in the plowlayer, where it will not be detected by a soil test. Over time this S will be mineralized as plant available S. Therefore, while some S is expected to leach, a substantial amount may be retained in the soil organic matter. This is why soil test S by itself is not necessarily a good predictor of S nutrition and currently other factors are used to predict S need via the Sulfur Availability Index. Table 1 shows the effect of wallboard application rate on the soil test S and forage S concentration. Materials were applied and incorporated prior to seeding in late April and early May of 1995. Soil samples were collected each July and the forage S values are for the second cutting each year. The annual precipitation received in the study years was either at or below average, with the exception of somewhat higher values at Spooner in 1995 (35.3 in.) and Ashland in 1996 (38.1 in.). These data show the rapid increase in soil test S in 1995, which moderated in 1996, and for the 1 ton/a rate were similar to the control in 1997. The S concentration of the harvested forage responded to the application of S and responses were greater at the sites in northwestern Wisconsin, where historically S response has been more common. A tissue concentration in the range of 0.25 – 0.50 is considered sufficient for the top six inches of alfalfa sampled at the late bud to early flower growth stage. The only significant yield responses observed in the study were at Ashland and Spooner in 1997 (data not shown), which had relatively low forage S concentrations. These data suggest that large gypsum applications will initially cause a large increase soil test S, which over a period of two years return close to background when applied rates of 1 – 2 ton/a. Rates greater than this are not economical and creates a risk on lighter soils where the excessive Ca displaces other cations such as K and Mg, which may be leached from the plowlayer. The plant analysis data shows the potential supply of S is still high and likely comes from S mineralized from organic matter. Over the years since the wallboard research was conducted S deposition in precipitation has decreased, increasing the potential for S response in crops. Applications of 1 – 2 ton gypsum/a should supply adequate S for alfalfa grown in normal rotations. Producers concerned about S nutrition should use a combination of plant analysis and soil testing to confirm the need for S.